Where seen? 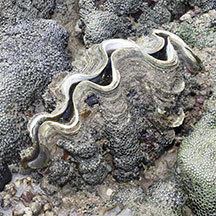 This beautifully sculptured giant clam is sometimes seen on our undisturbed Southern shores, near living reefs. 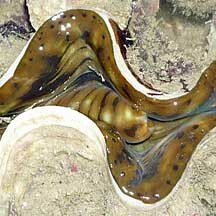 Features: 15-30cm. The two-part shell has 5-6 rows of deep open flutes on the valves. 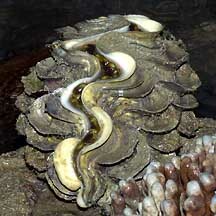 The wavy shell opening faces the sunlight, while the hinged side is firmly attached to rocks or coral rubble in relatively shallow water near living reefs. 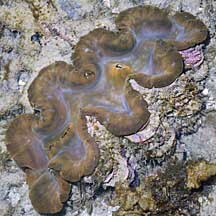 It does not burrow into coral. 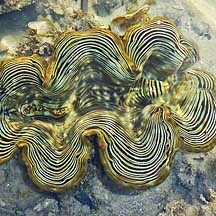 Status and threats: The Fluted giant clam (Tridacna squamosa) is listed as 'Endangered' on the Red List of threatened animals of Singapore. 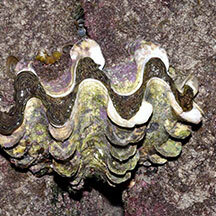 According to the Singapore Red Data Book: "Large specimens have virtually disappeared from our shores. 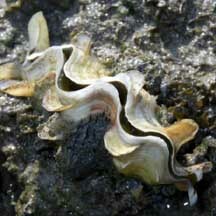 Young specimens are occasionally but infrequently seen". Photo shared by Abel Yeo on facebook. Photo shared by Toh Chay Hoon on her blog. 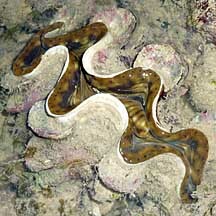 Giant Clam (Tridacna squamosa) Tan, Leo W. H. & Ng, Peter K. L., 1988. 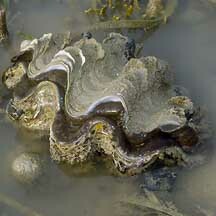 A Guide to Seashore Life. The Singapore Science Centre, Singapore. 160 pp. 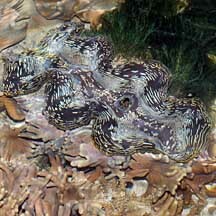 Fluted giant clam (Tridacna squamosa) on SeaLife Base: Technical fact sheet. 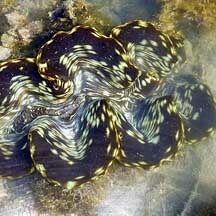 Fluted giant clam (Tridacna squamosa) on the NParks Flora and Fauna website. 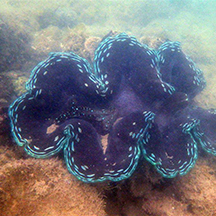 Tridacna squamosa (Veneroida: Cardiidae) Fluted giant clam by Tricia Poh Shi Min, 2015, on taxo4254. 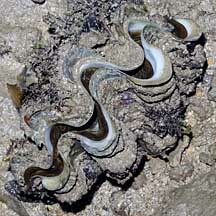 Fluted giant clam (Tridacna squamosa) in the Bivalves section by J.M. 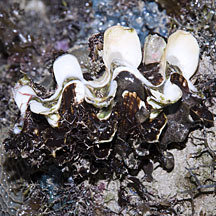 Poutiers in the FAO Species Identification Guide for Fishery Purposes: The Living Marine Resources of the Western Central Pacific Volume 1: Seaweeds, corals, bivalves and gastropods on the Food and Agriculture Organization of the United Nations (FAO) website. 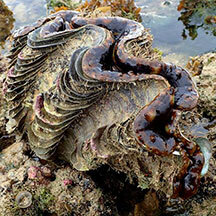 Eckman W, Vicentuan-Cabaitan K & Todd PA (2014) Observations on the hyposalinity tolerance of fluted giant clam (Tridacna squamosa, Lamarck 1819) larvae. 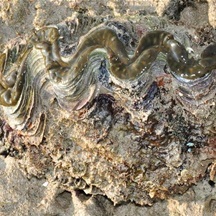 Nature in Singapore, 7: 111–116. Neo Mei Lin & Loh Kok Sheng. 5 September 2014. 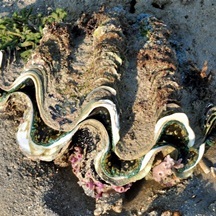 Giant clam shells ‘graveyard’ at Semakau Landfill, Tridacna squamosa. Singapore Biodiversity Records 2014: 248-249. 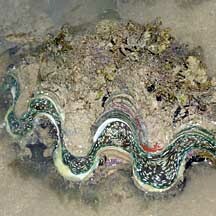 Neo ML & Todd PA (2013) Conservation status reassessment of giant clams (Mollusca: Bivalvia: Tridacninae) in Singapore. 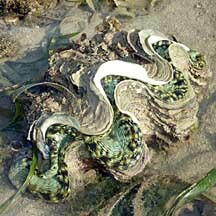 Nature in Singapore, 6: 125–133. 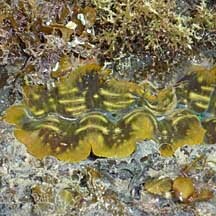 Neo ML, Todd PA, Chou LM & Teo SL-M (2011) Spawning induction and larval development in the fluted giant clam, Tridacna squamosa (Bivalvia: Tridacnidae). 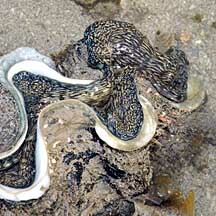 Nature in Singapore, 4: 157–161.